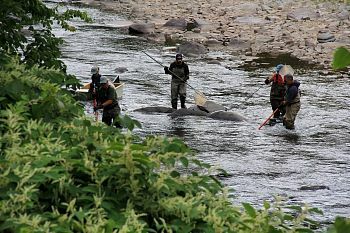 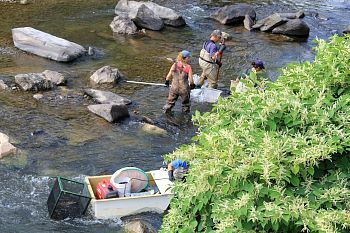 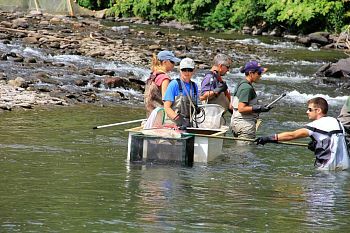 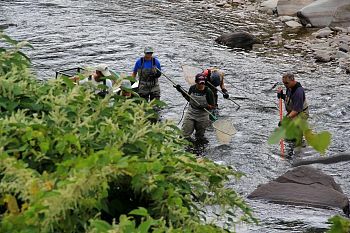 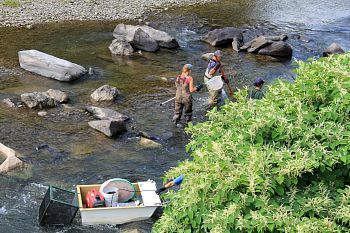 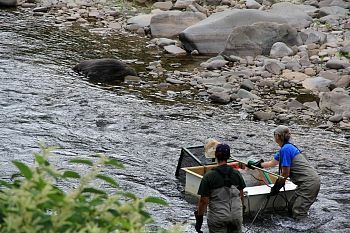 I was on my way to go fishing last Thursday morning when I noticed a team of DEC folks setting up for a fish count - something that I'd never seen. 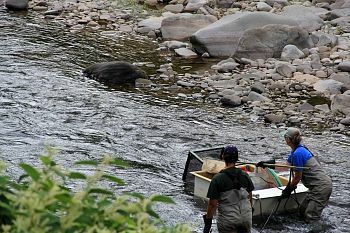 So instead of fishing, I watched them catch fish. 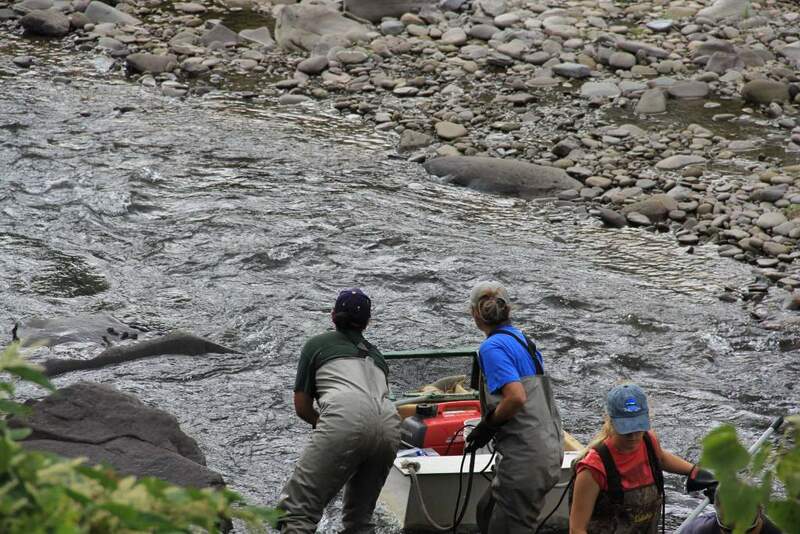 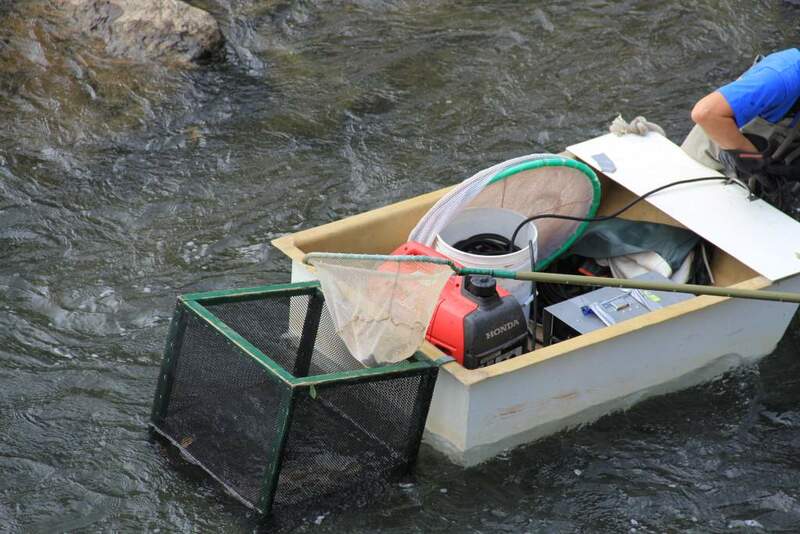 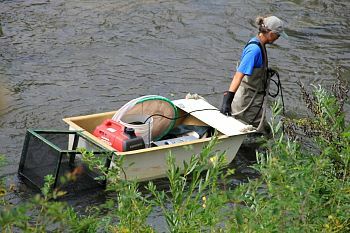 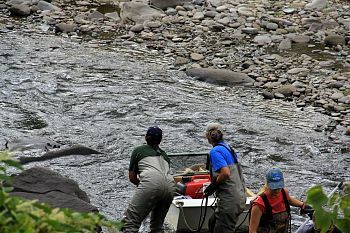 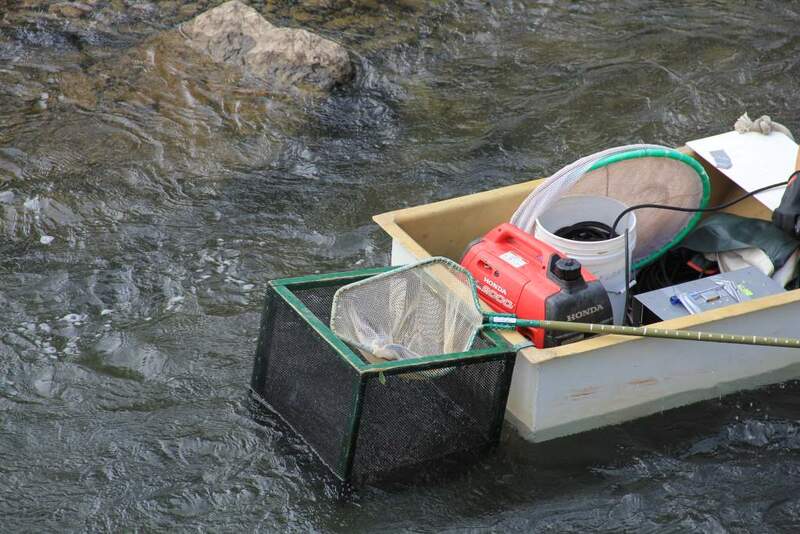 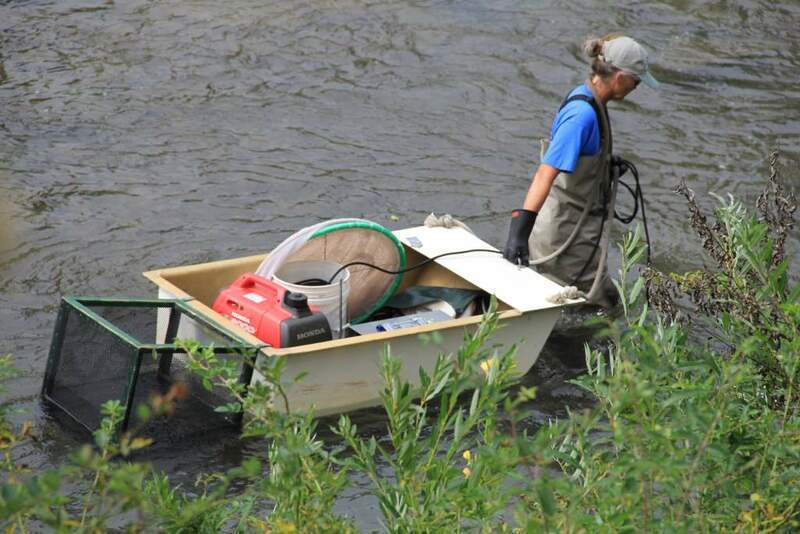 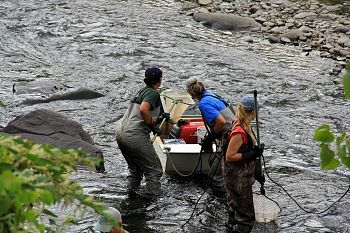 Here's how - In order to count the fish in the stream the DEC uses special equpment to temporarily shock them. 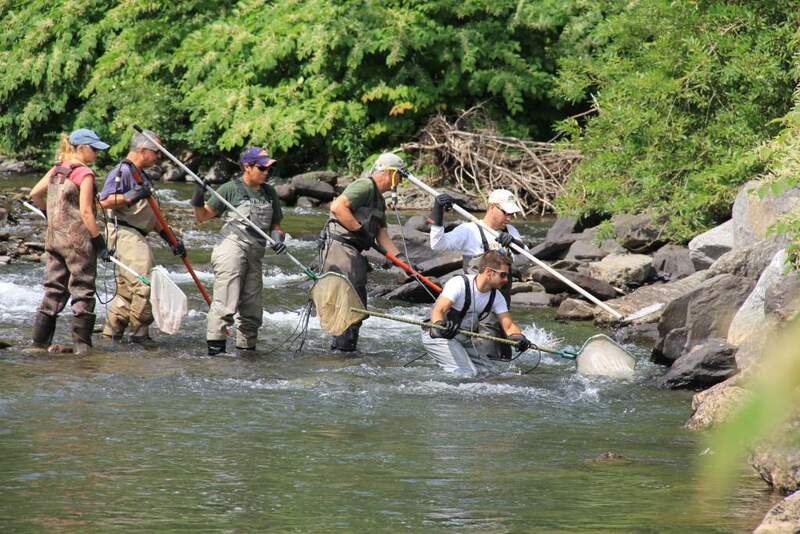 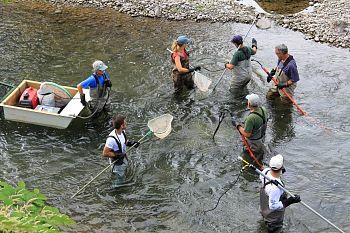 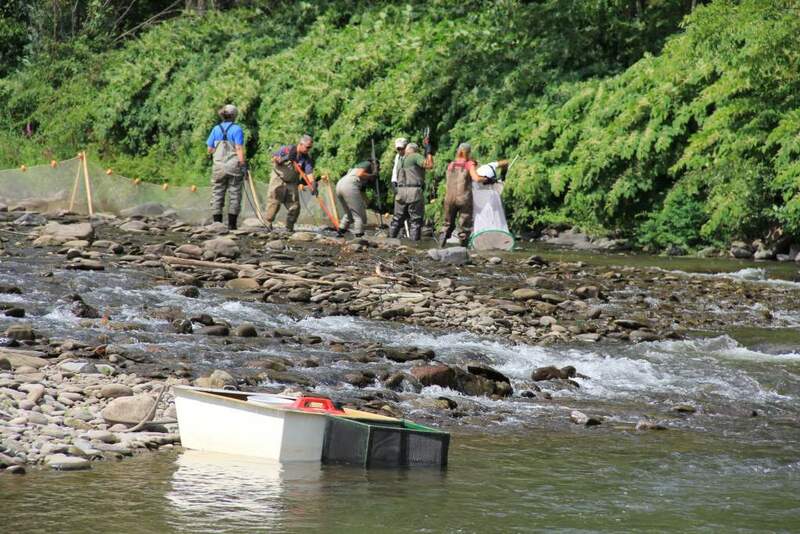 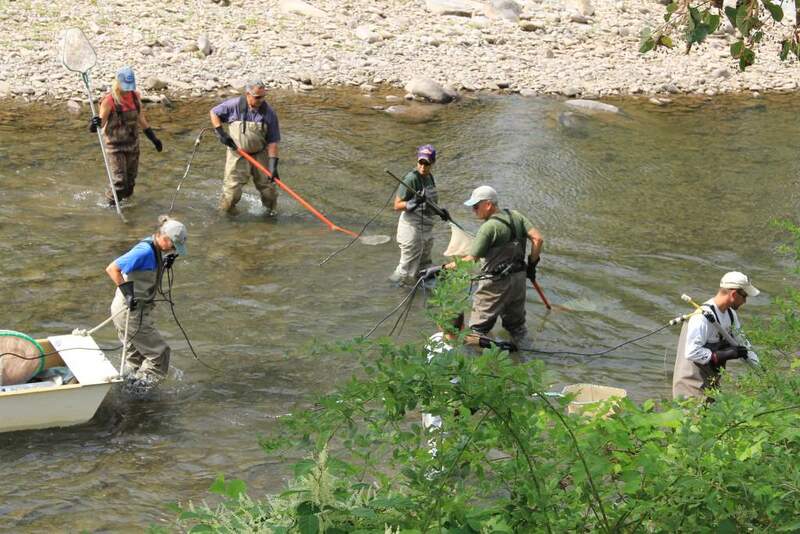 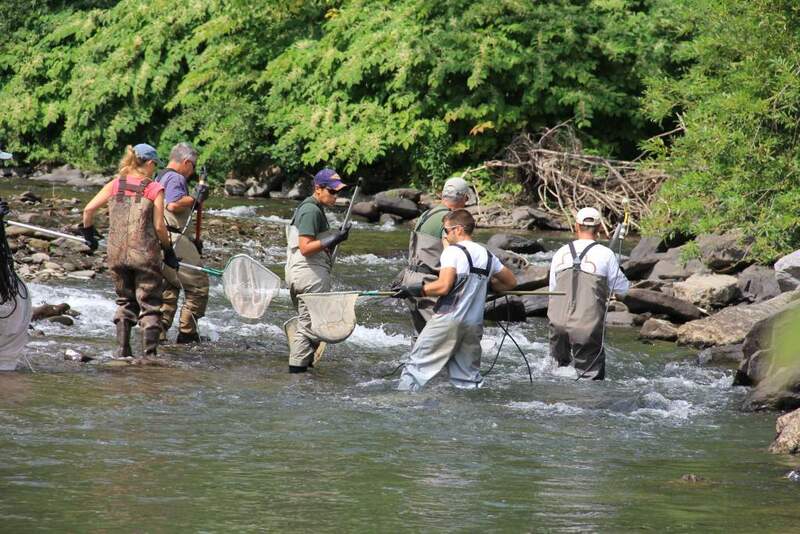 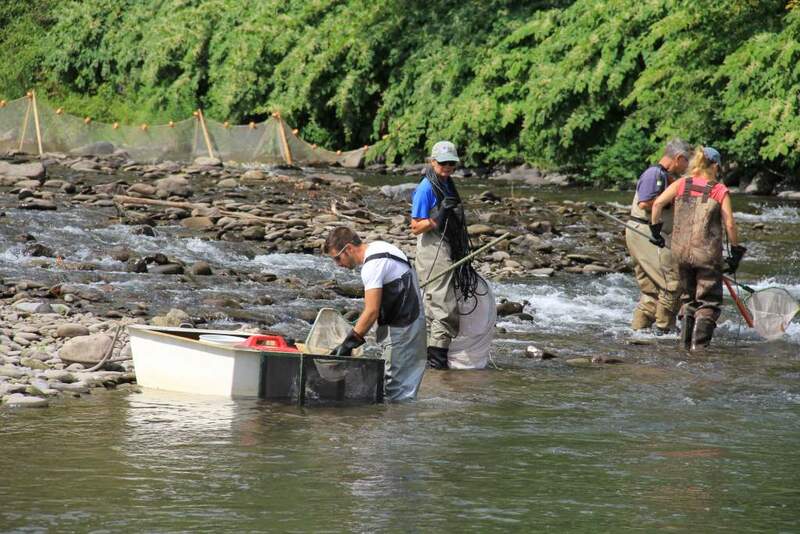 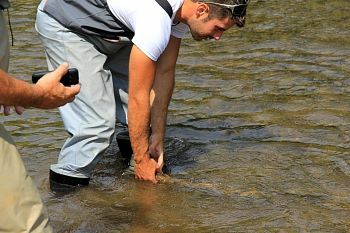 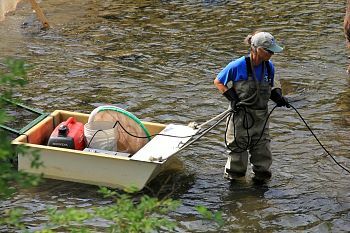 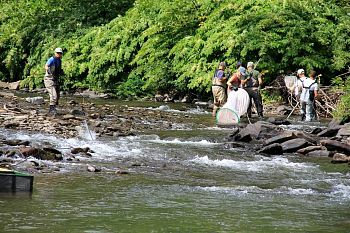 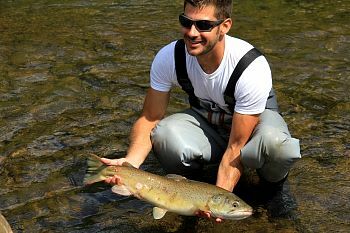 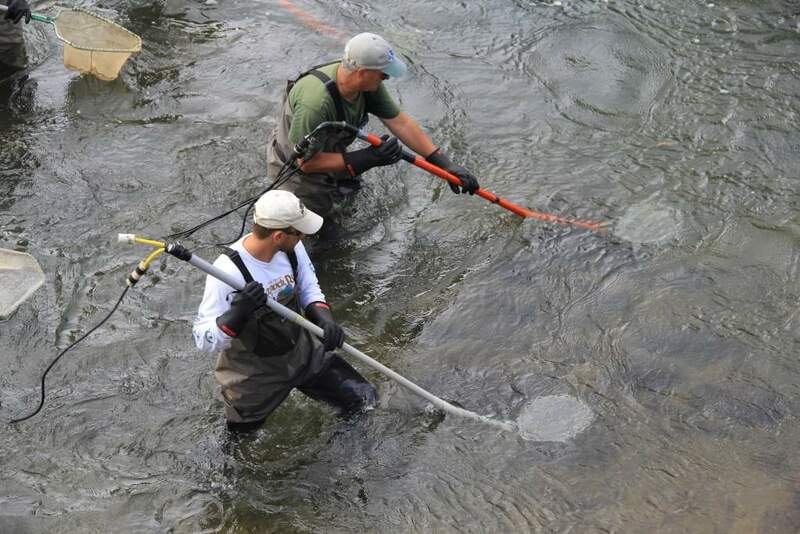 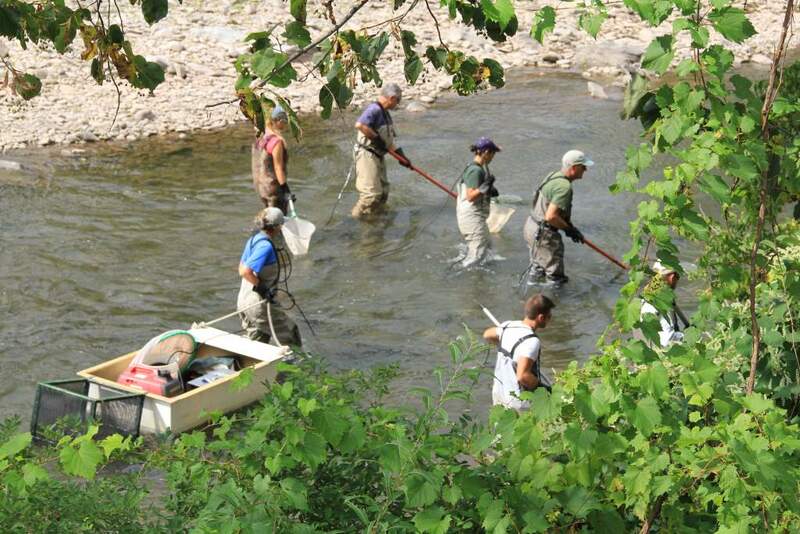 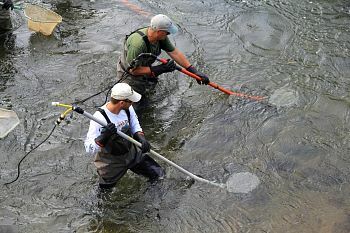 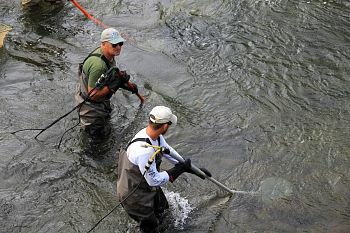 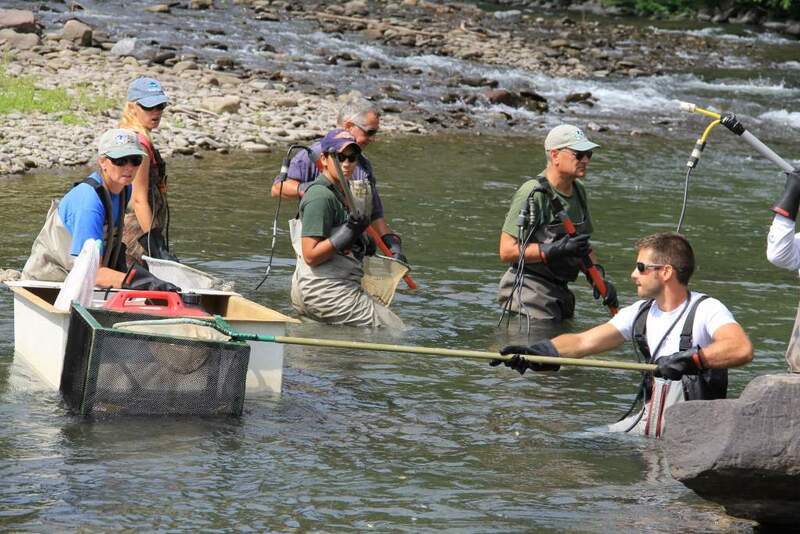 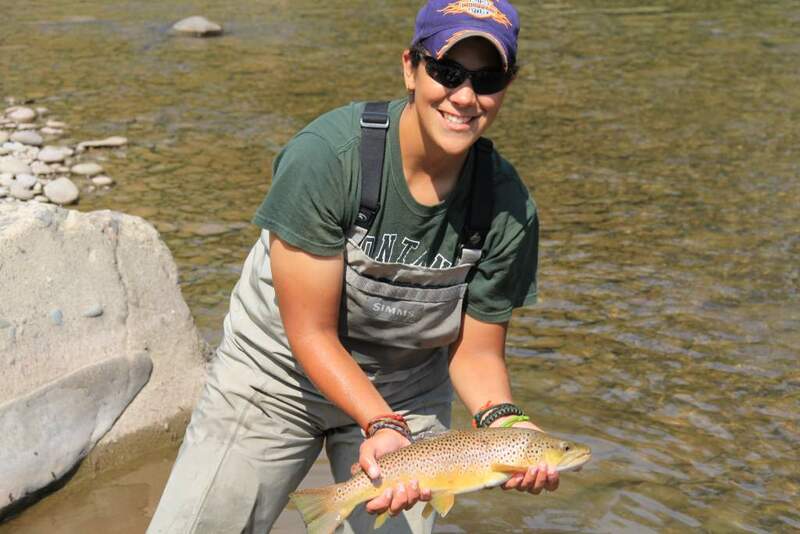 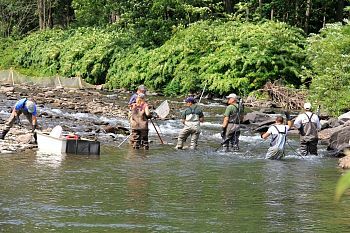 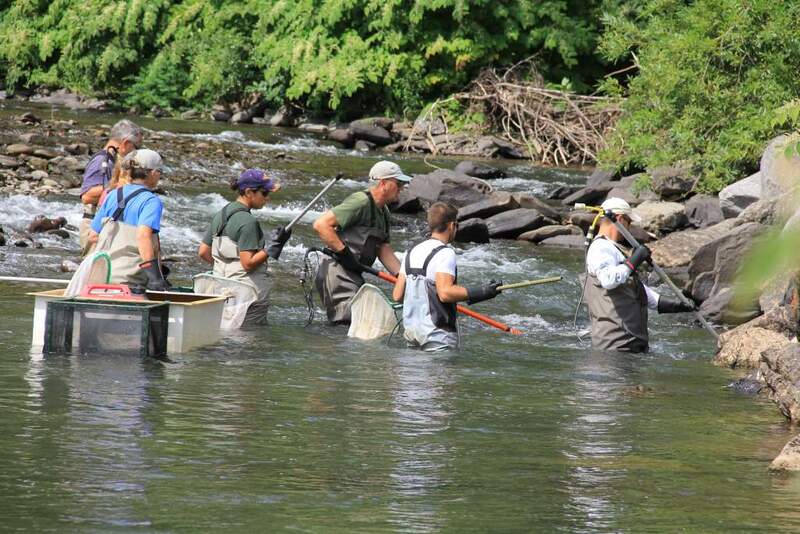 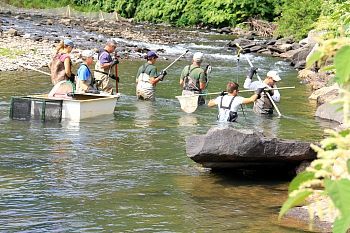 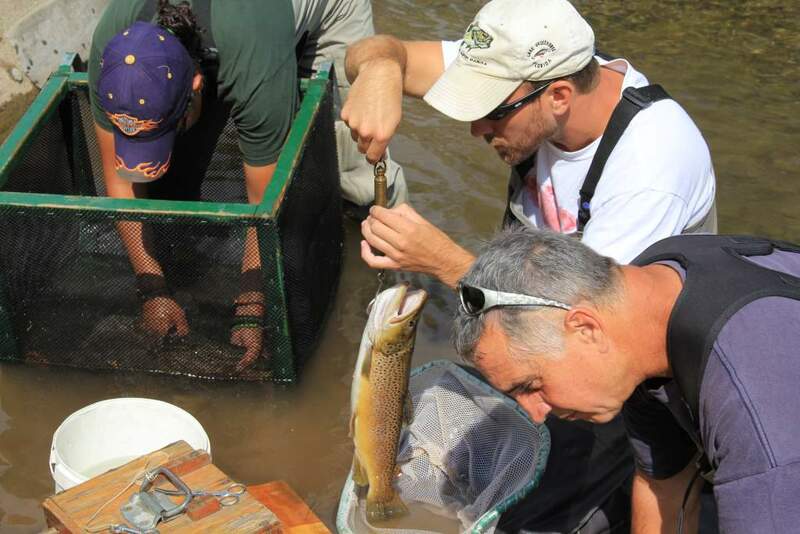 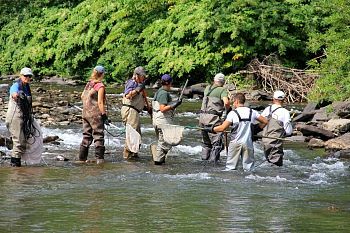 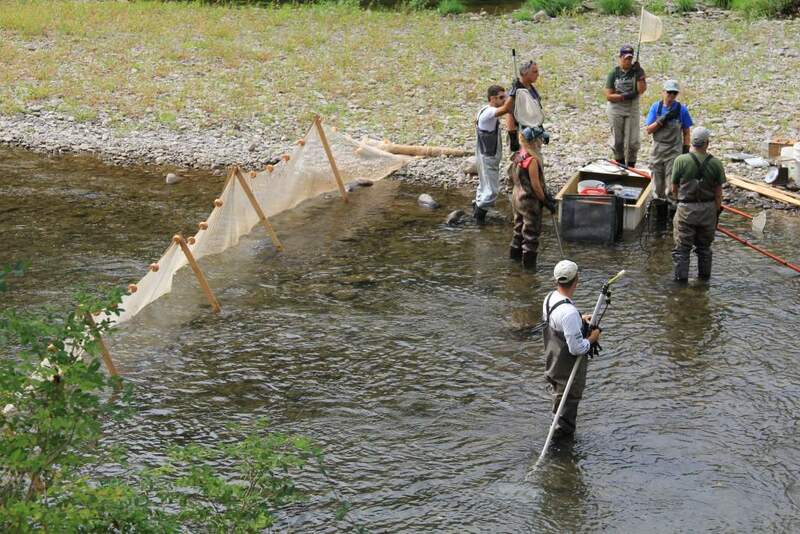 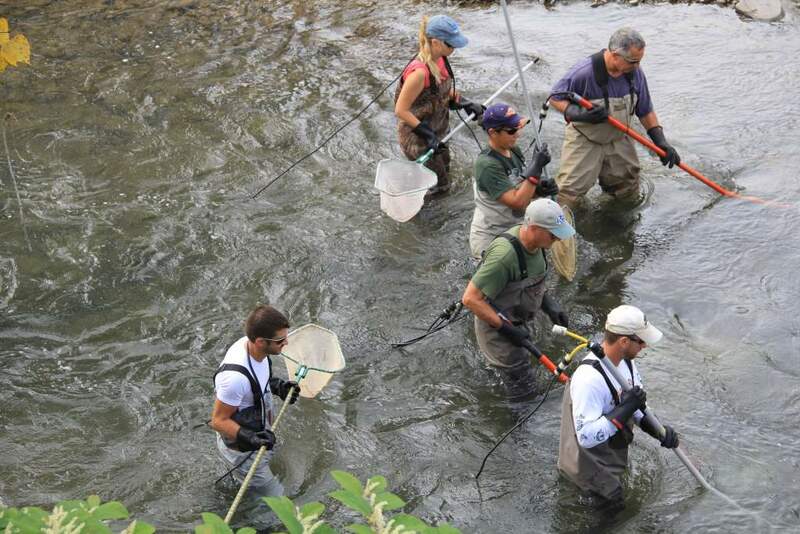 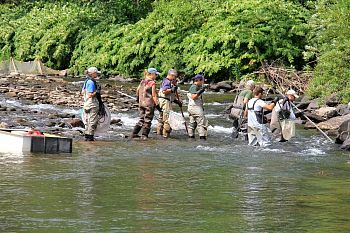 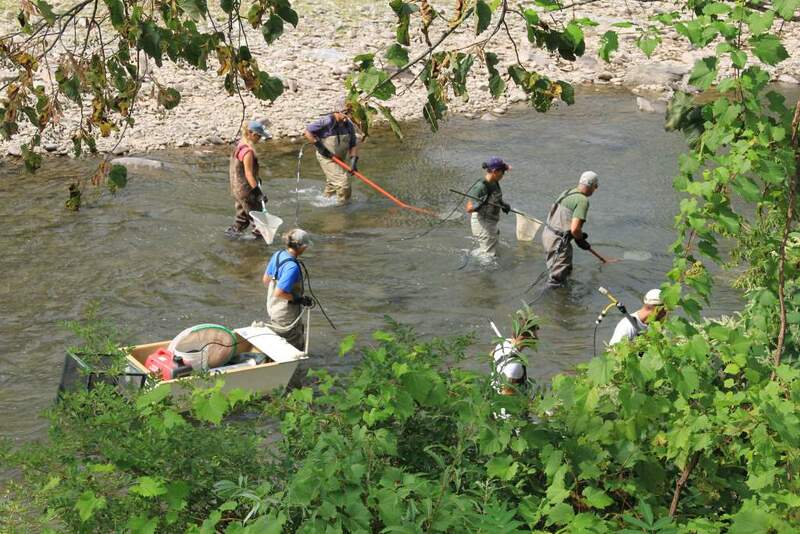 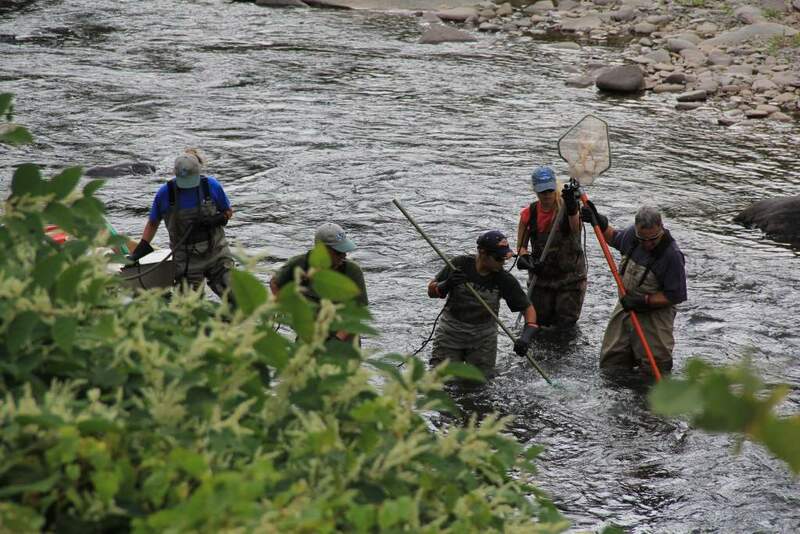 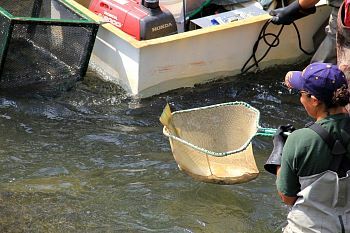 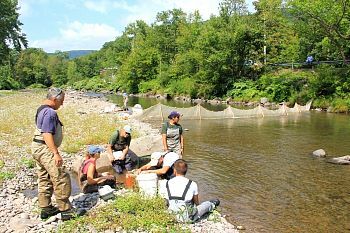 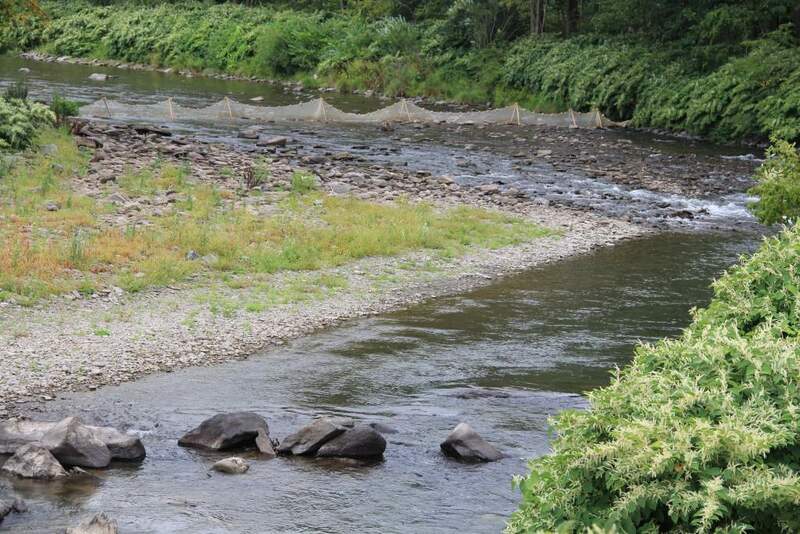 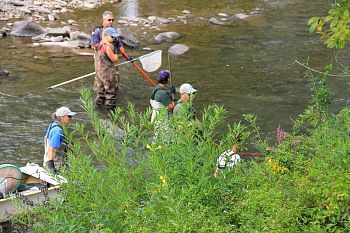 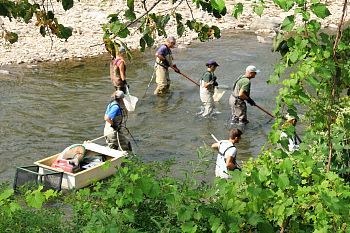 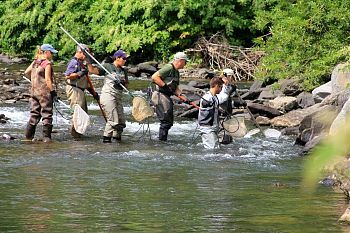 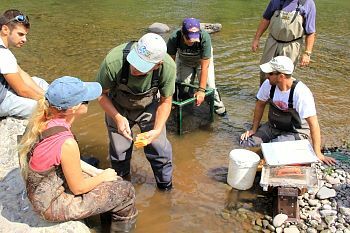 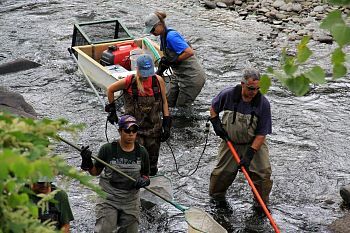 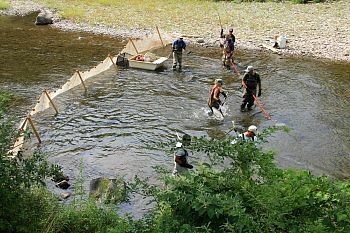 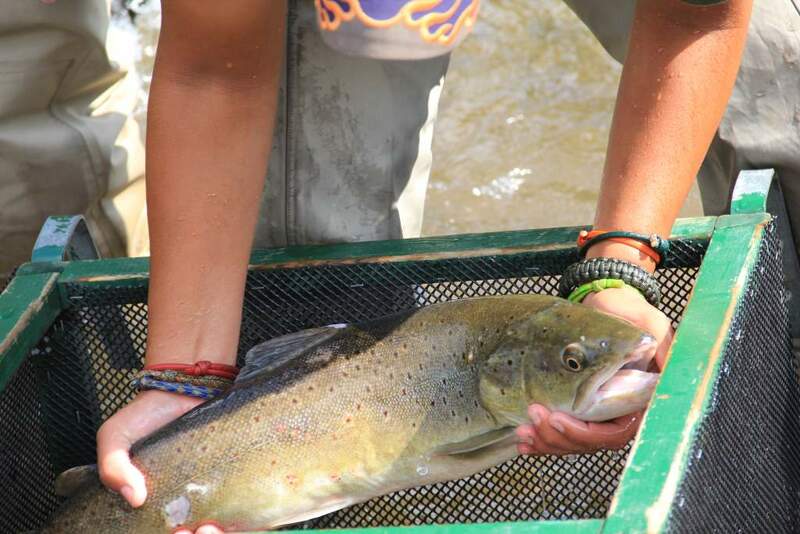 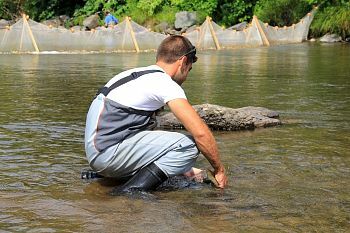 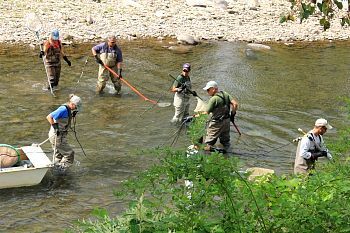 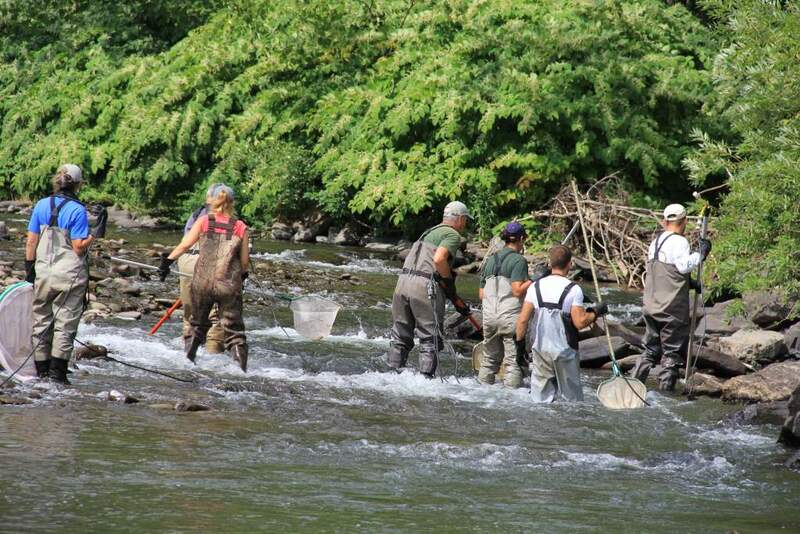 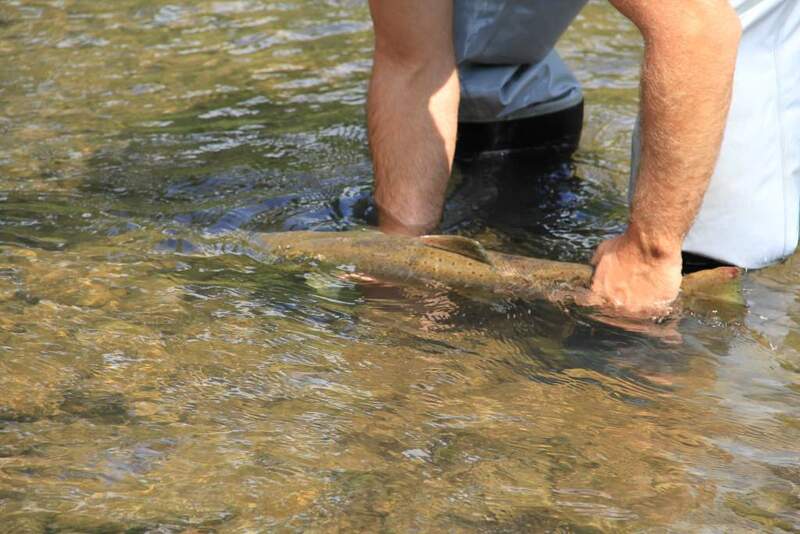 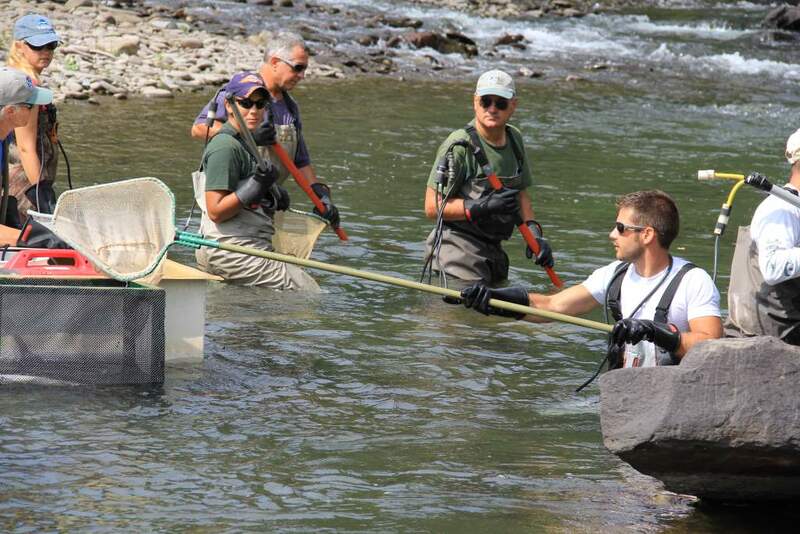 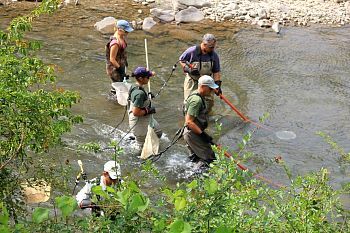 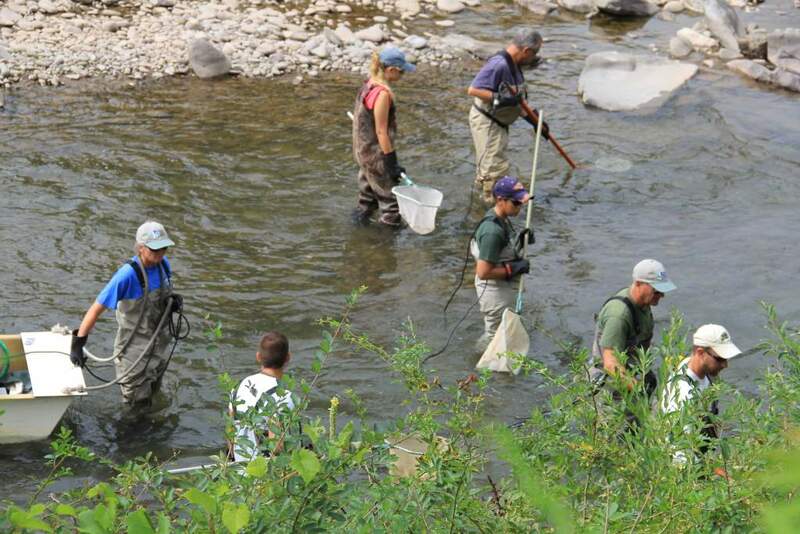 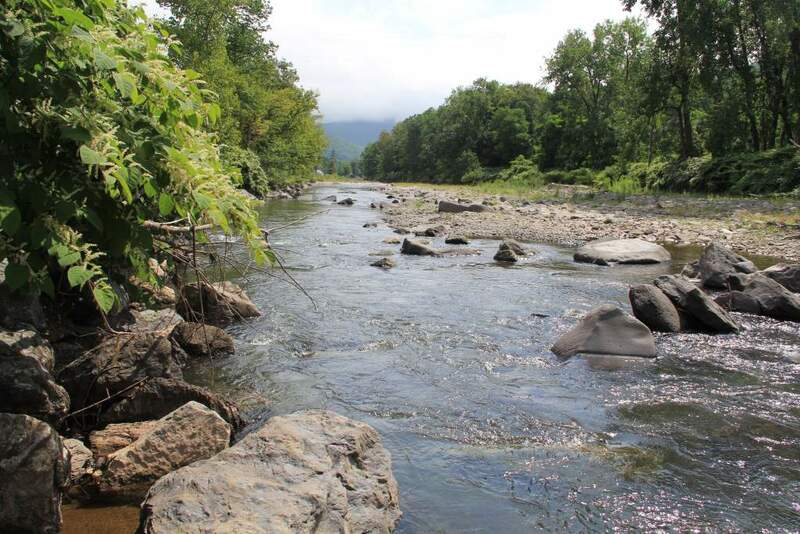 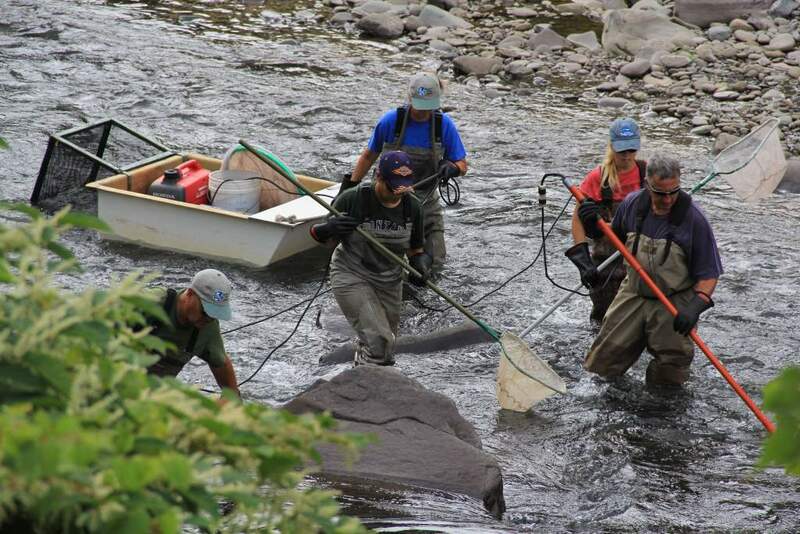 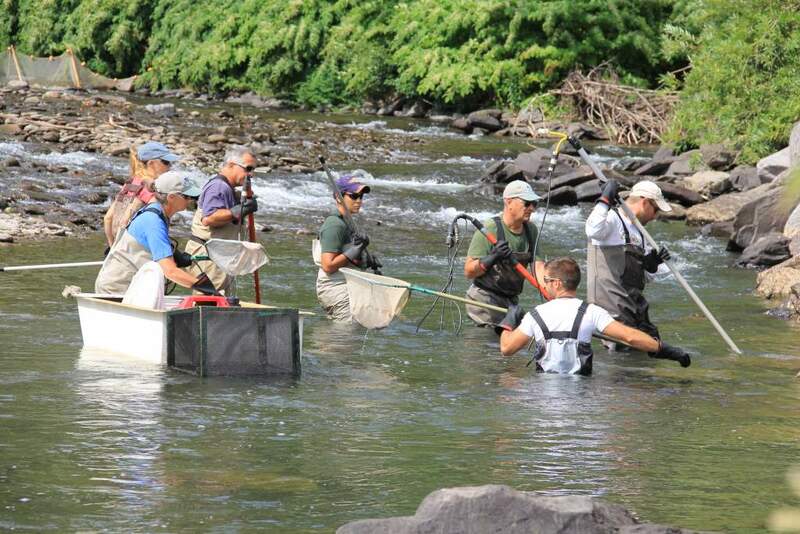 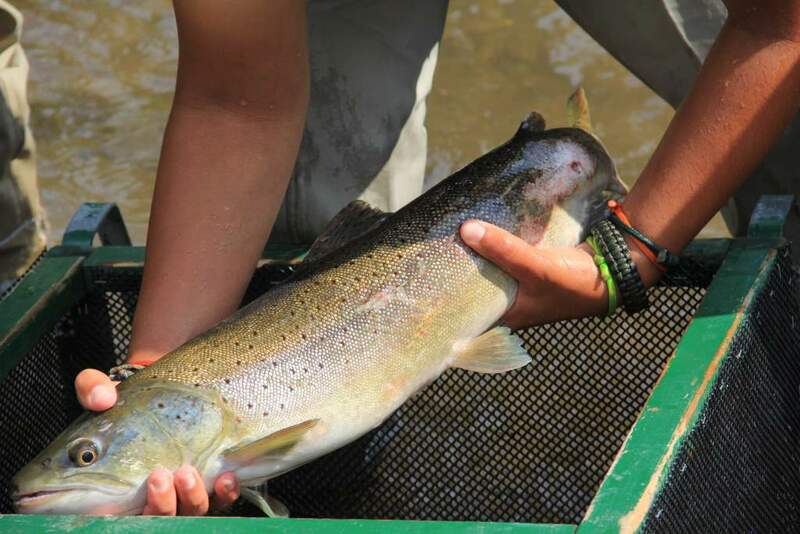 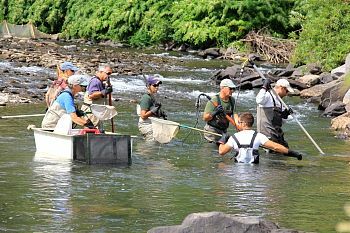 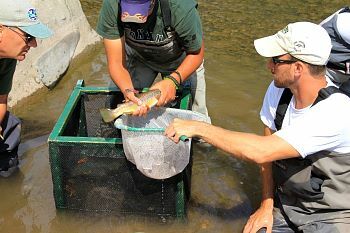 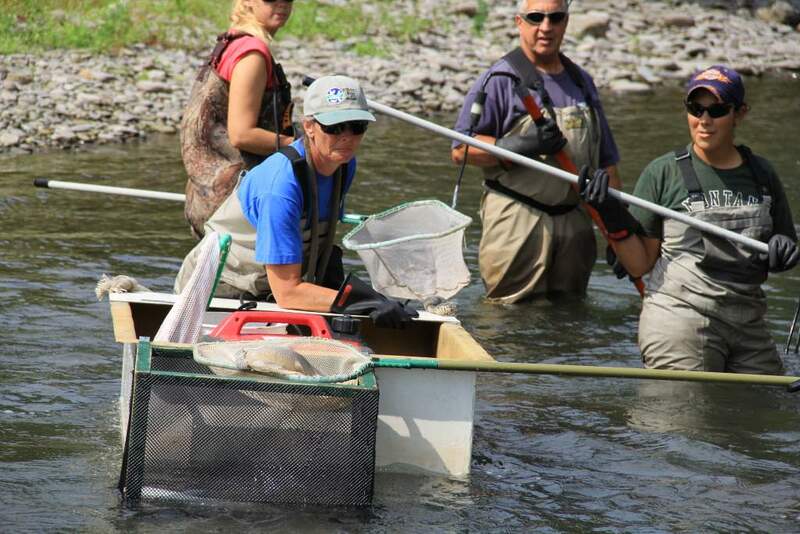 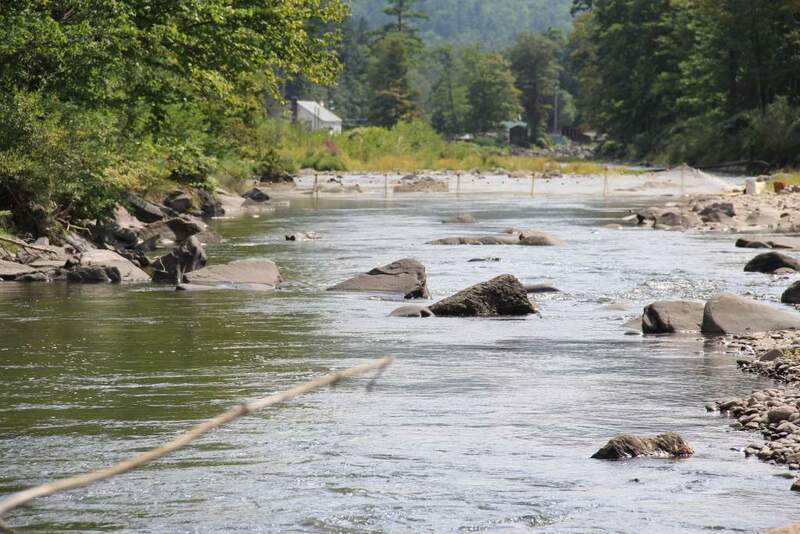 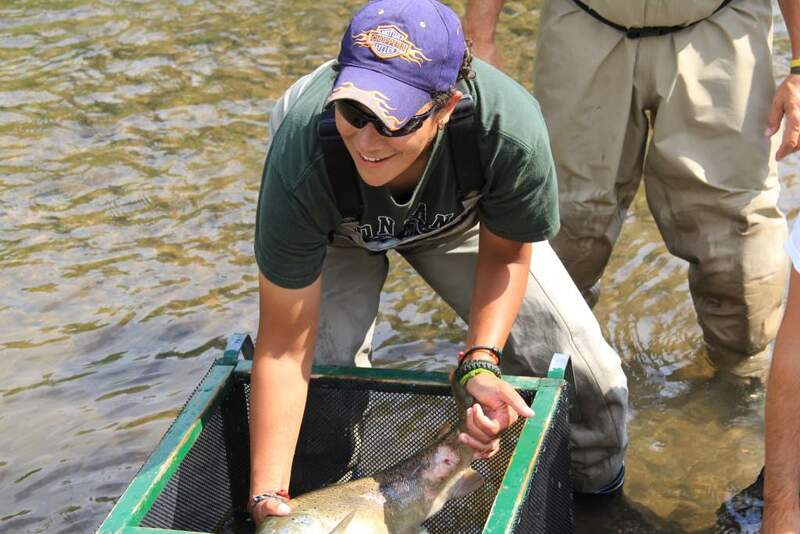 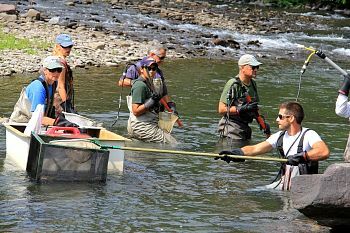 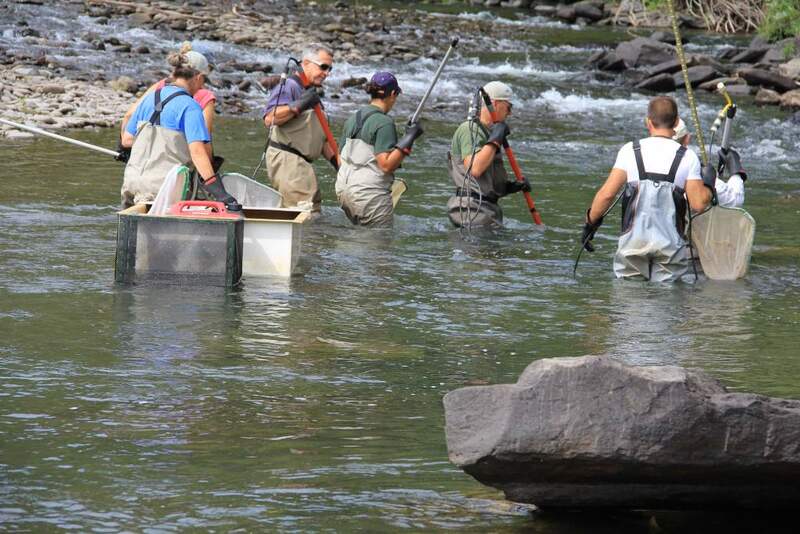 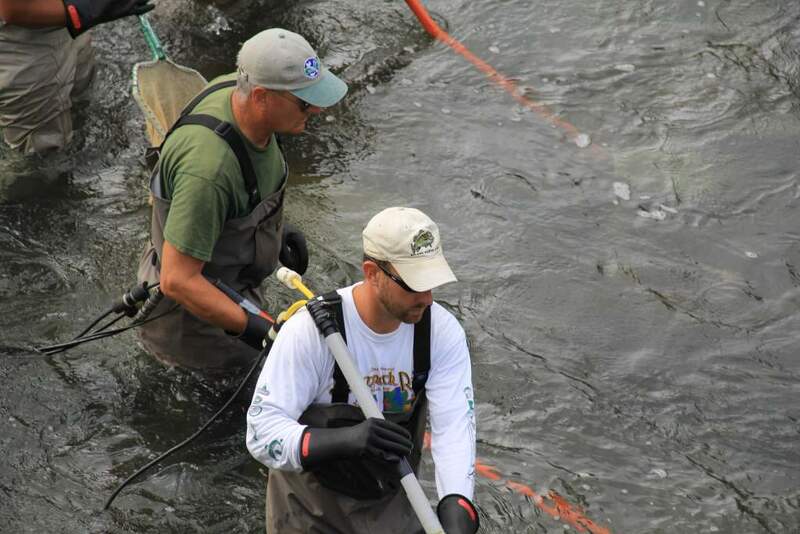 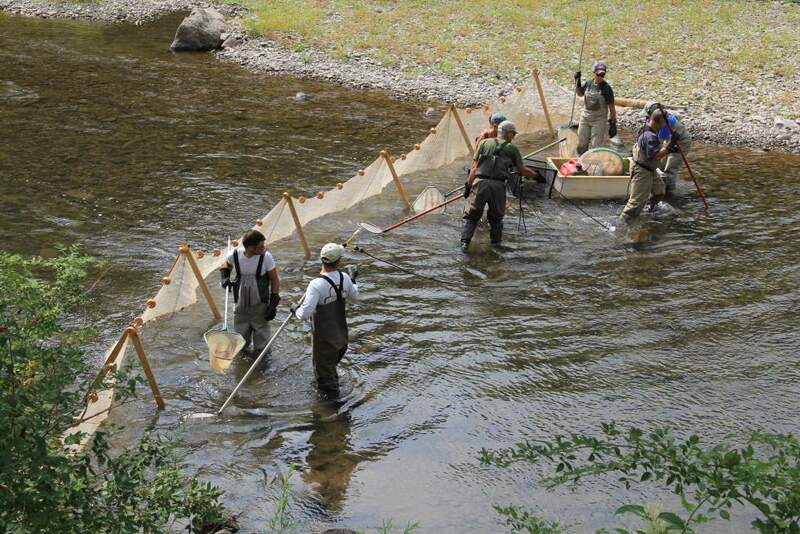 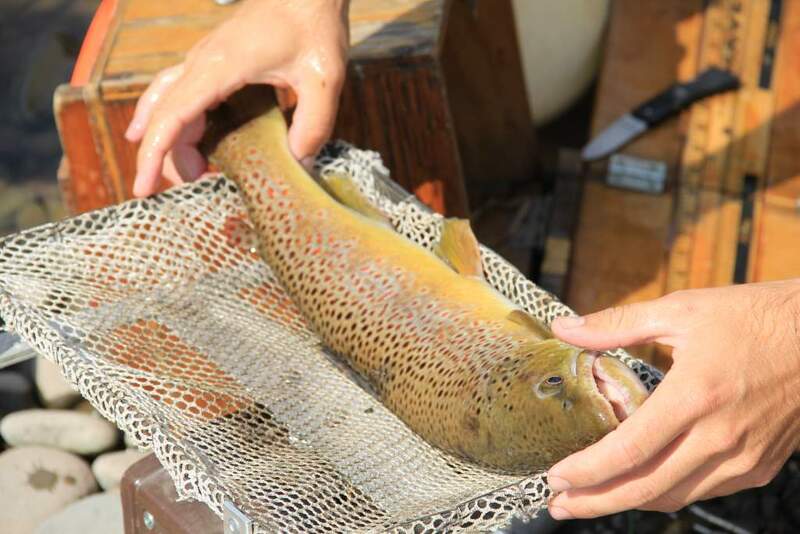 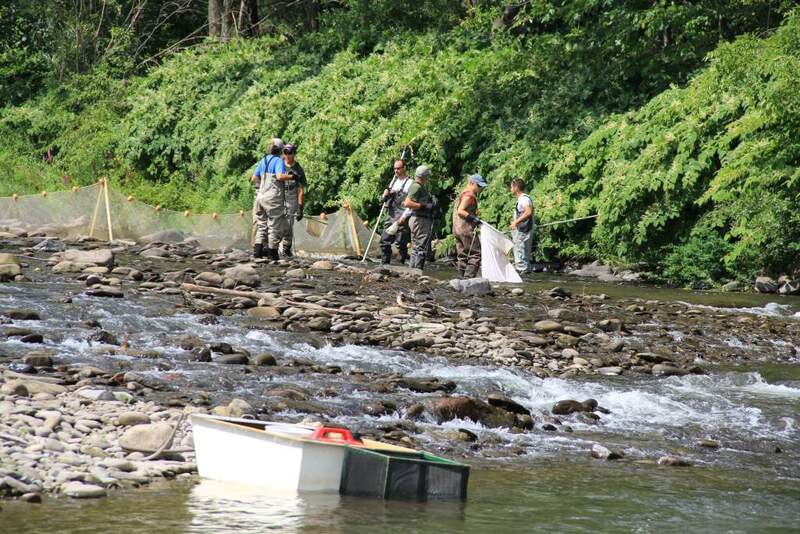 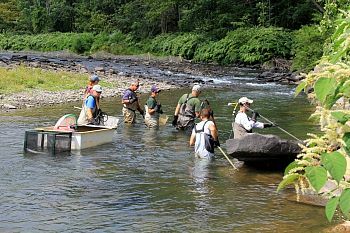 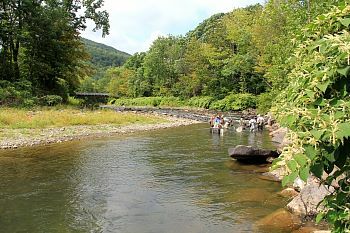 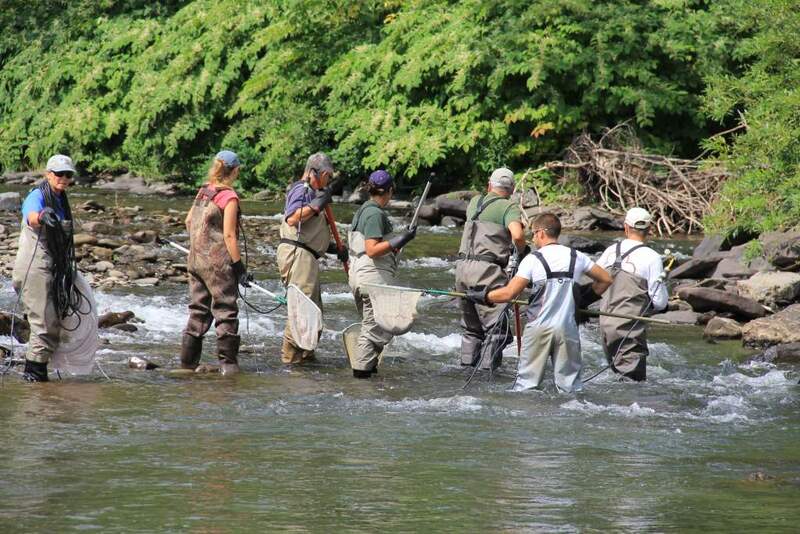 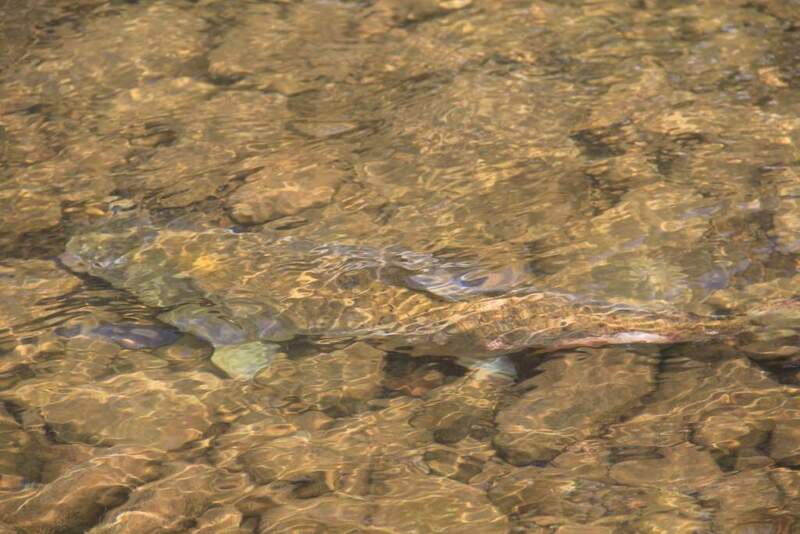 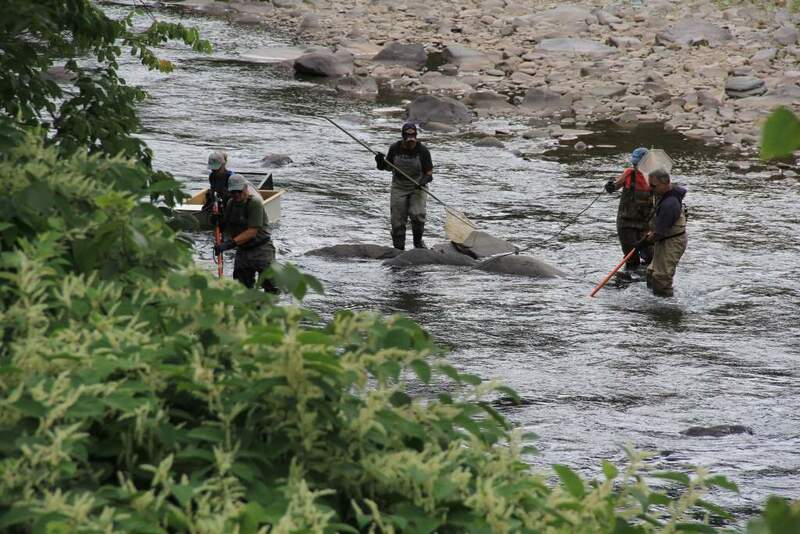 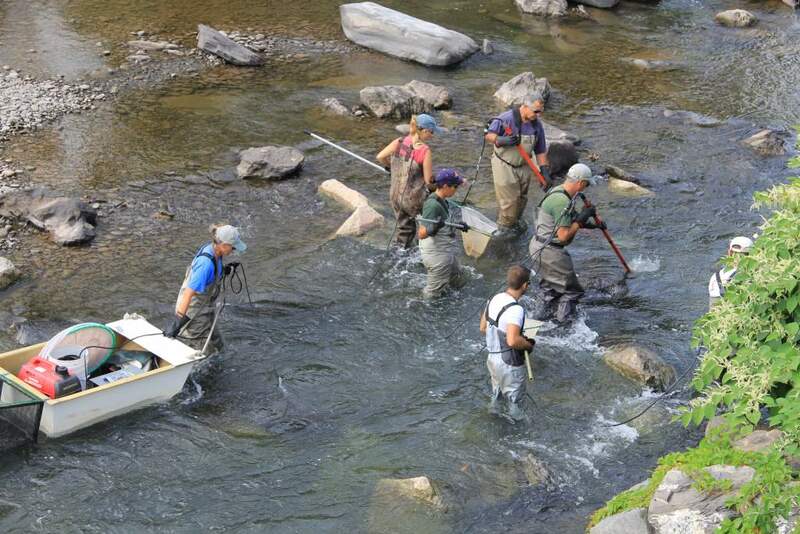 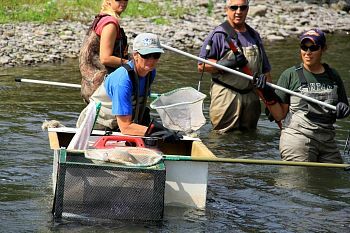 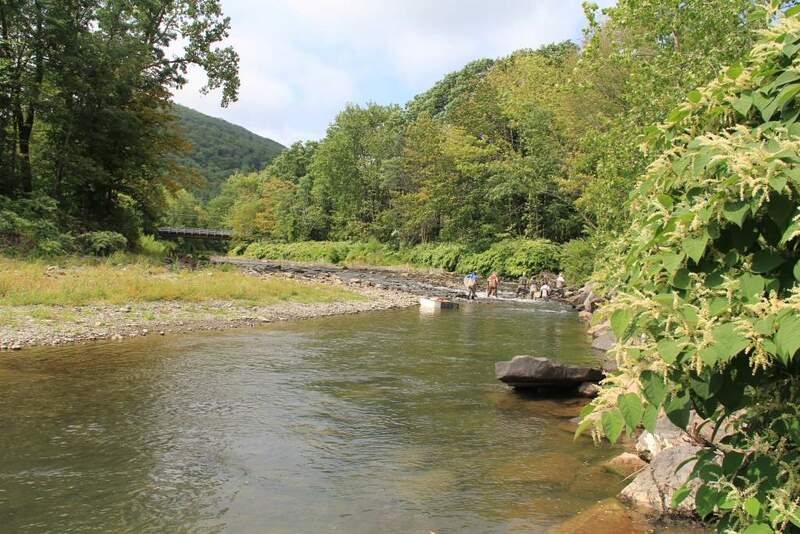 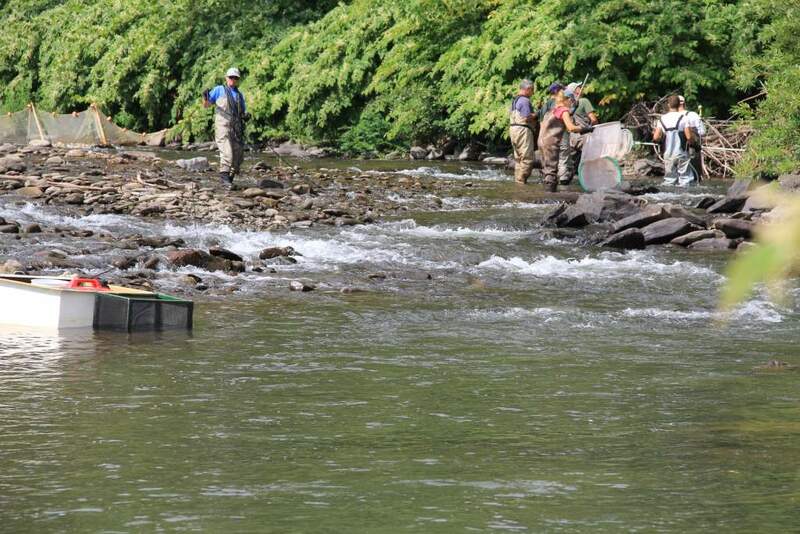 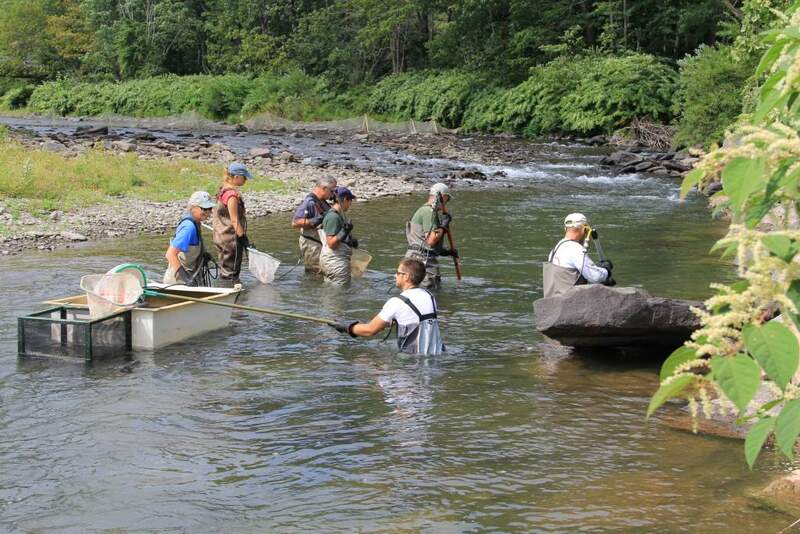 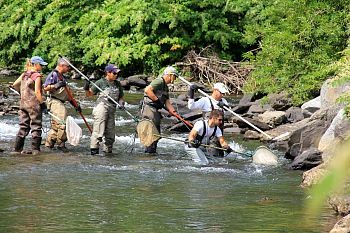 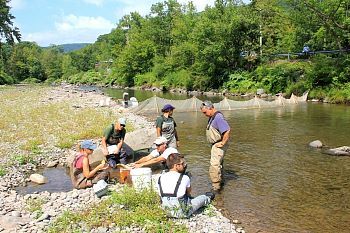 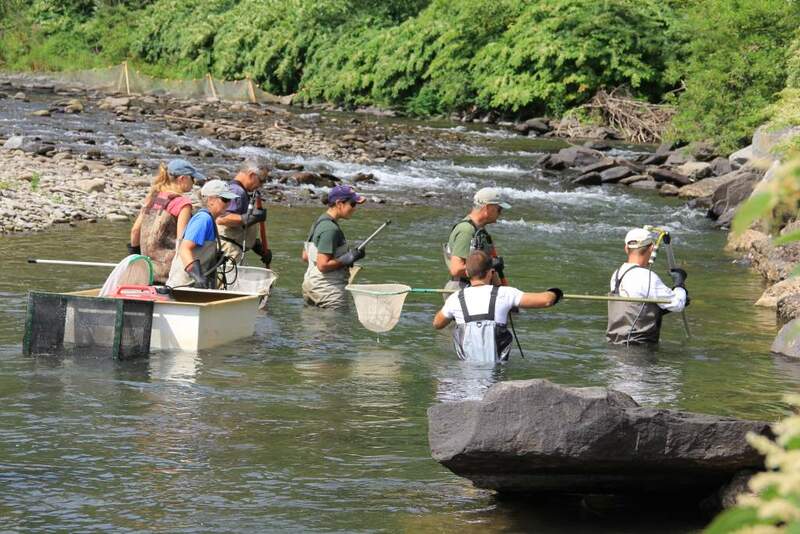 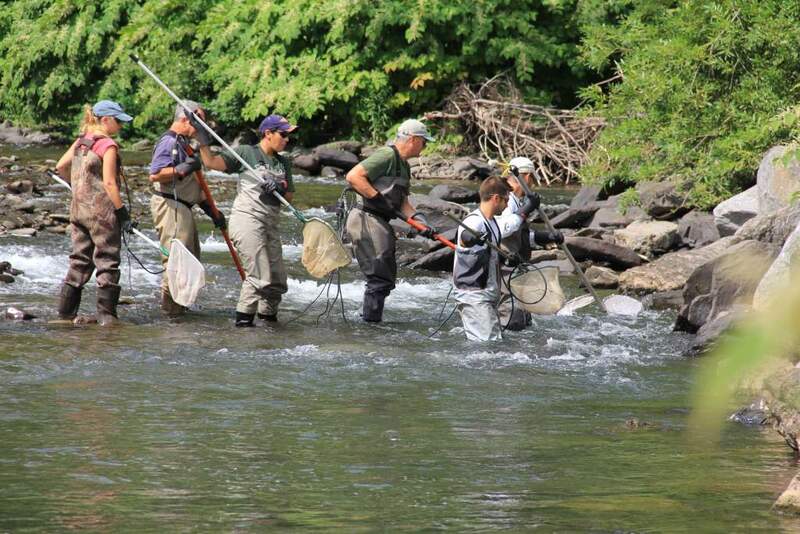 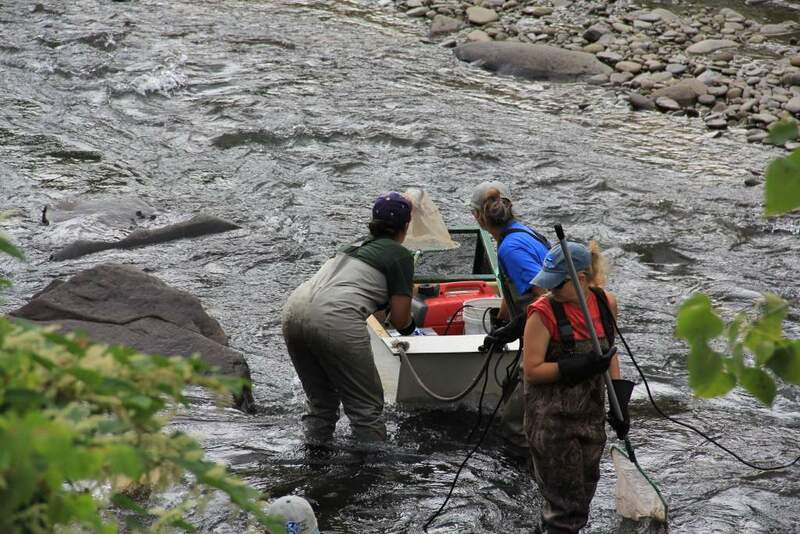 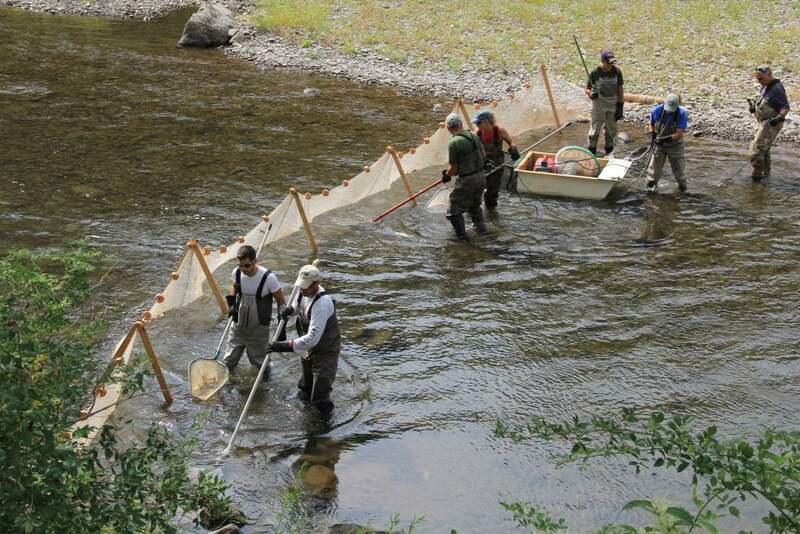 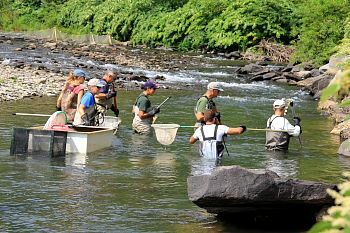 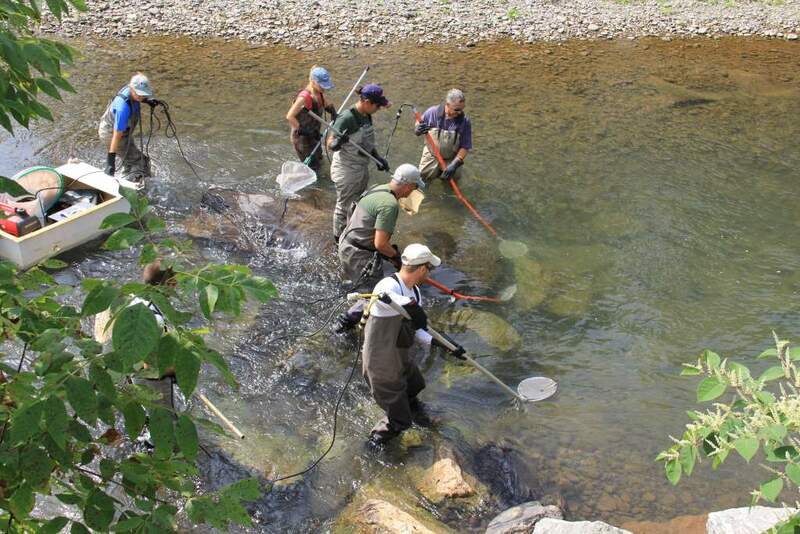 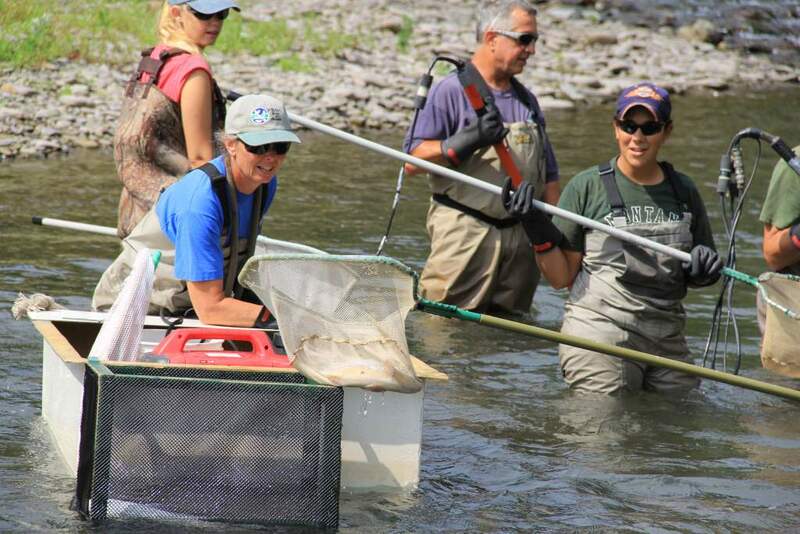 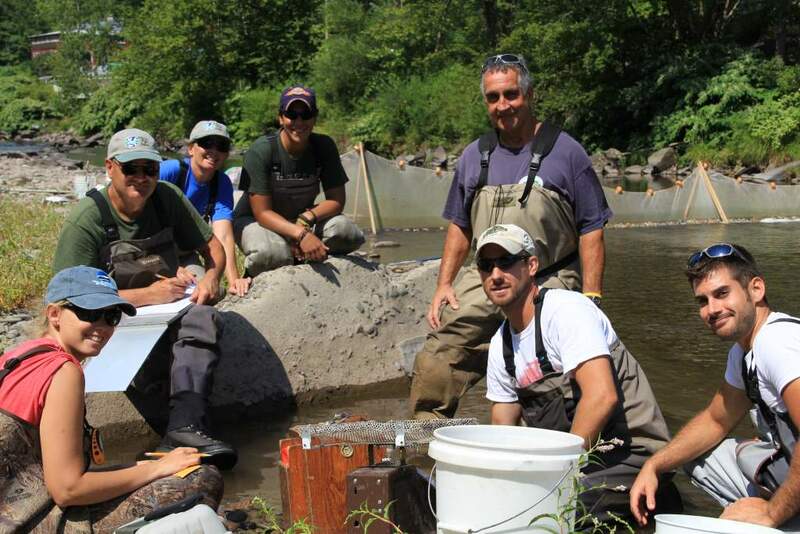 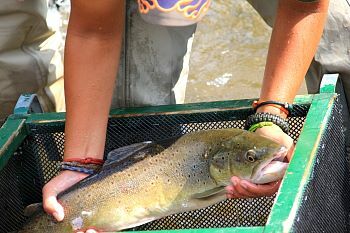 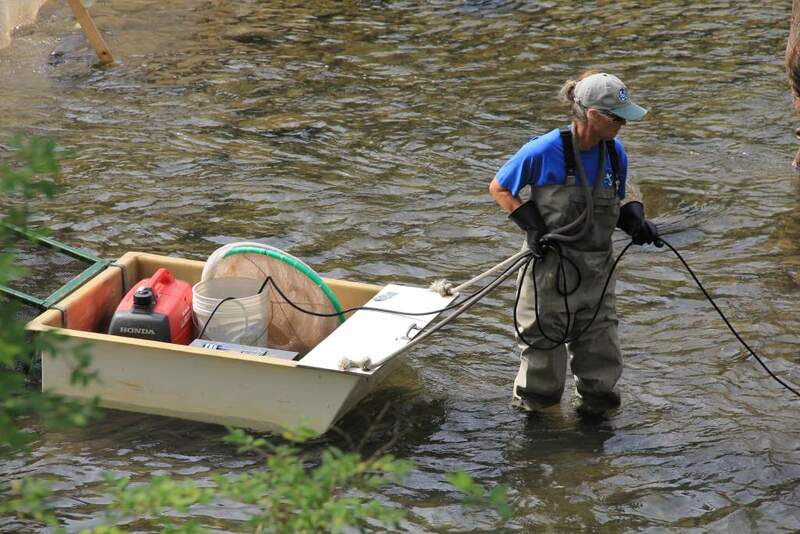 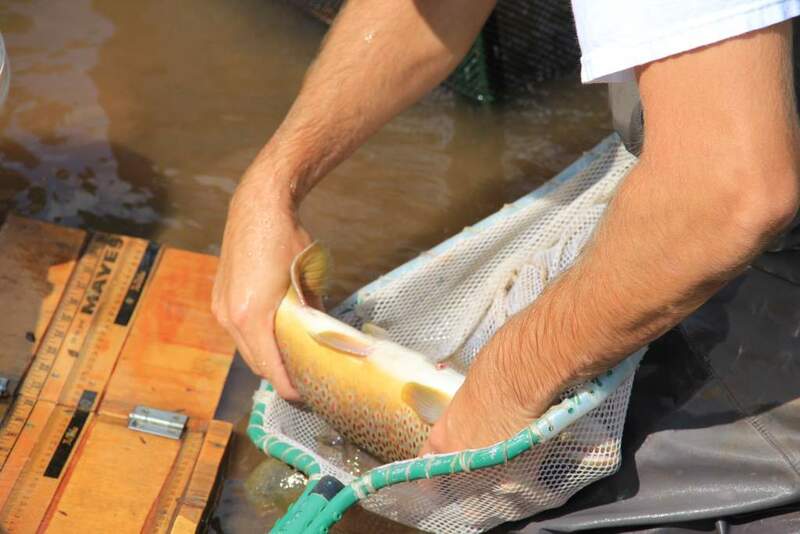 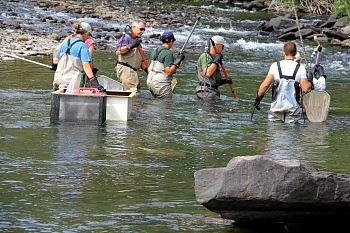 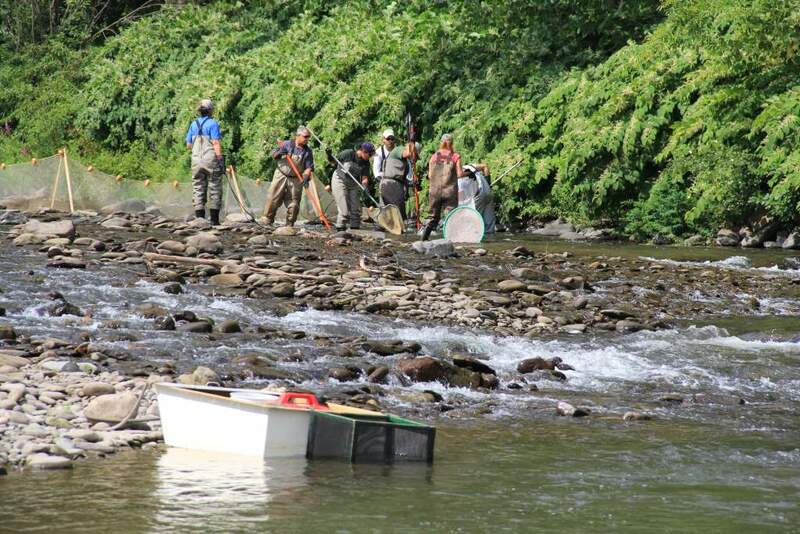 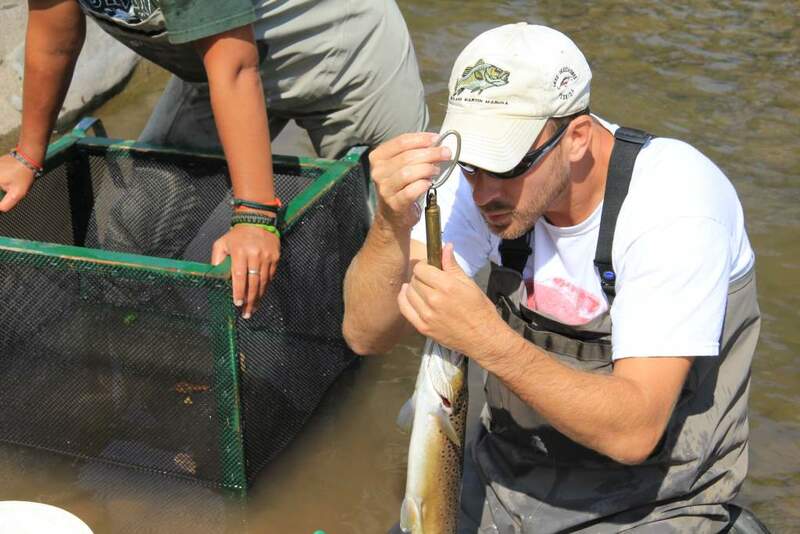 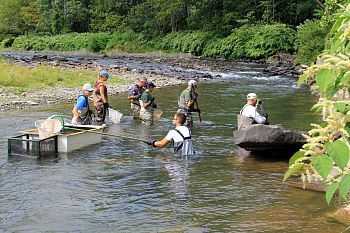 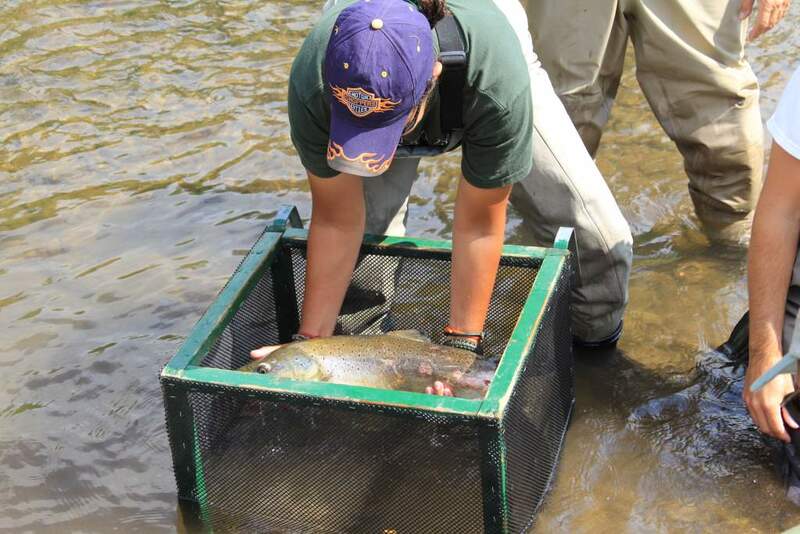 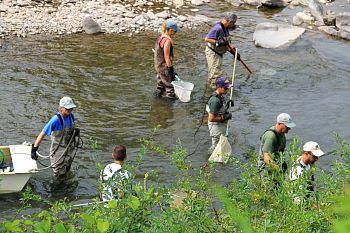 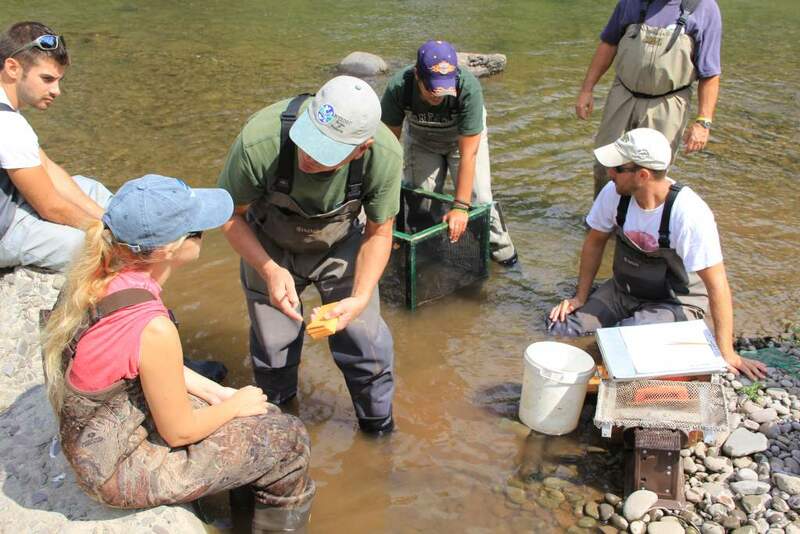 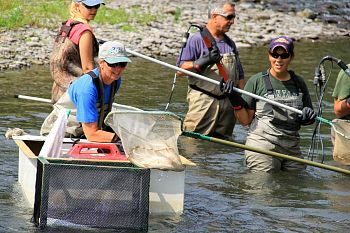 First they net-off a section of stream approximately 150 yards long. 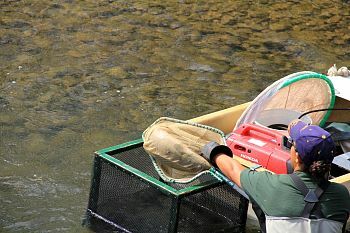 This keeps the fish inside the netted area. 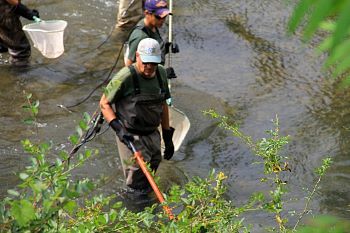 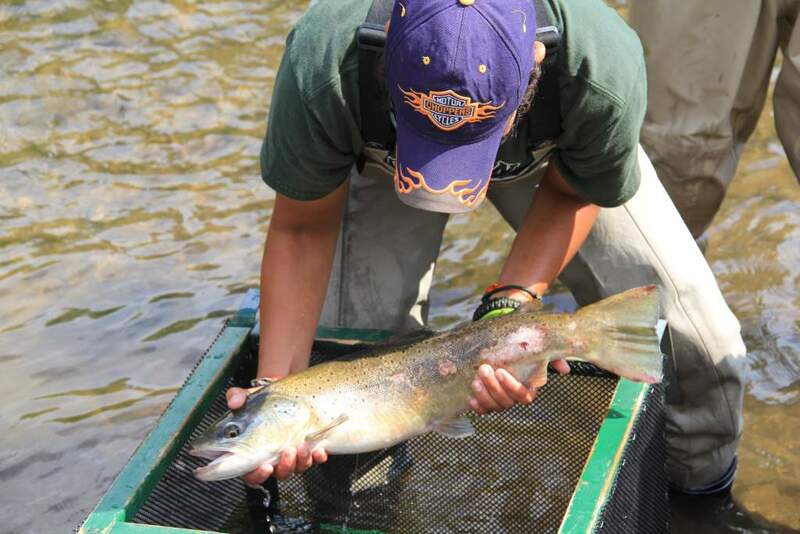 Next, the "shockers" carefully cover and poke around every inch of the bottom in search of fish. 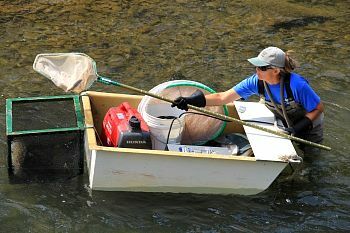 Shocked fish float up, sort of, and the netters, wadding behind the shockers, net the fish and transfer them into the water box on the back end of the support boat. They do this until they cover the entire area. 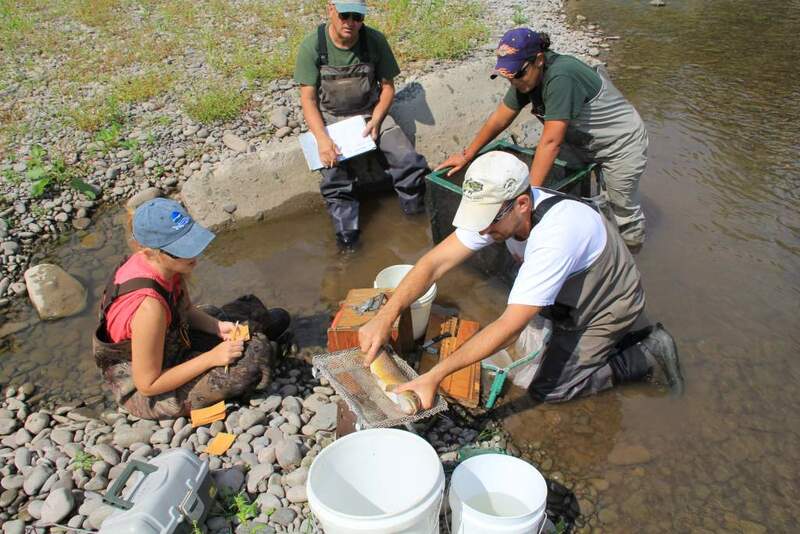 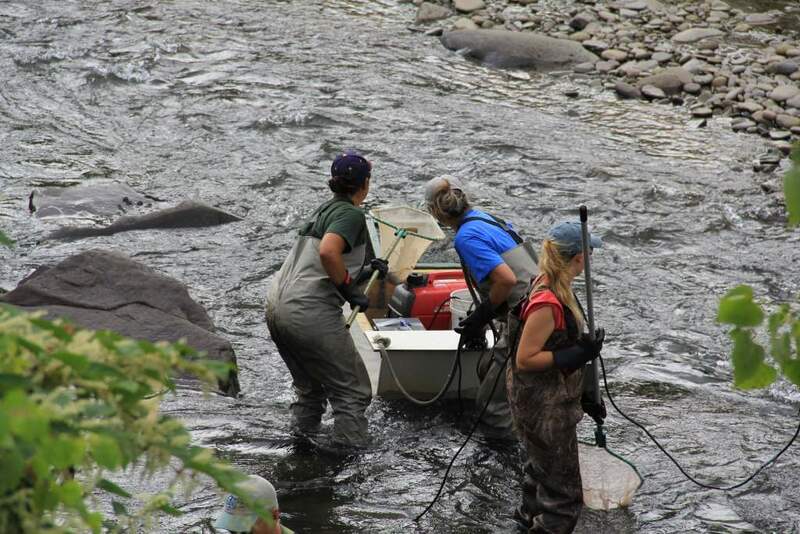 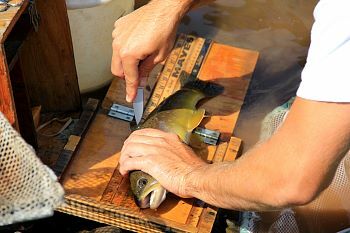 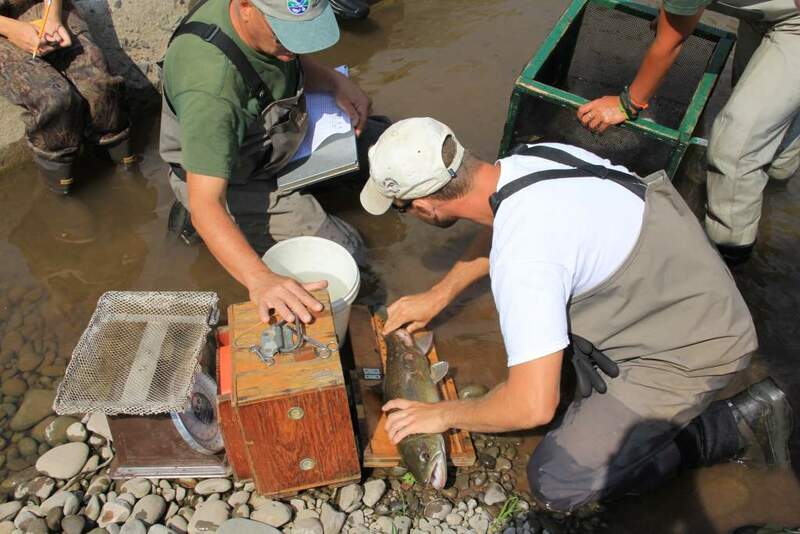 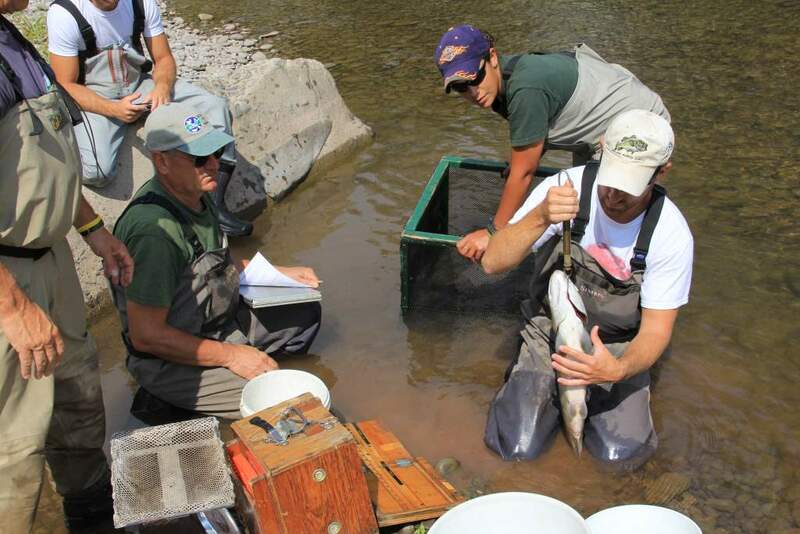 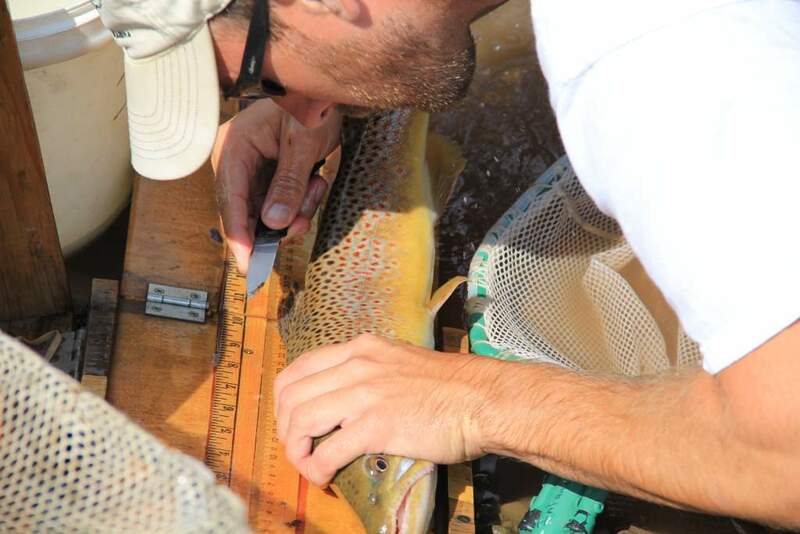 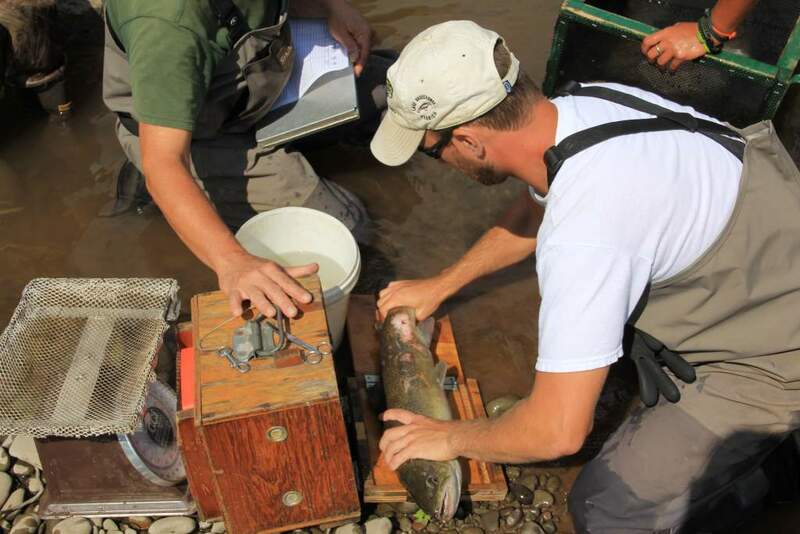 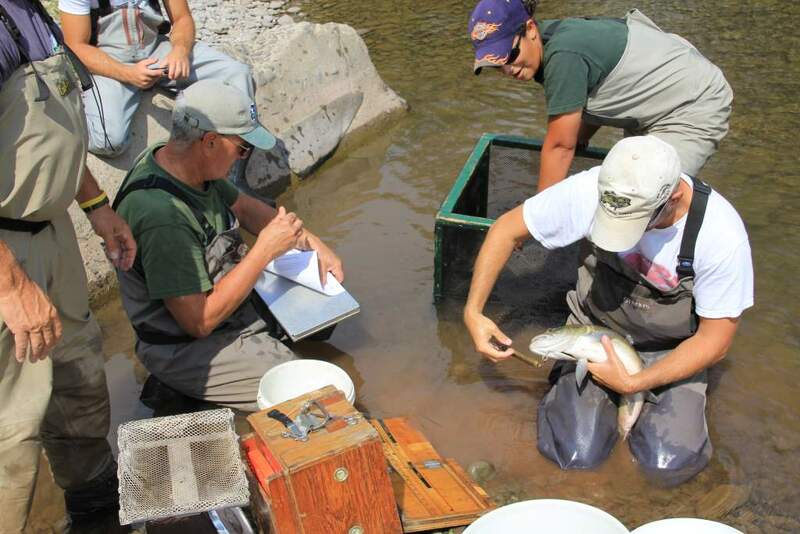 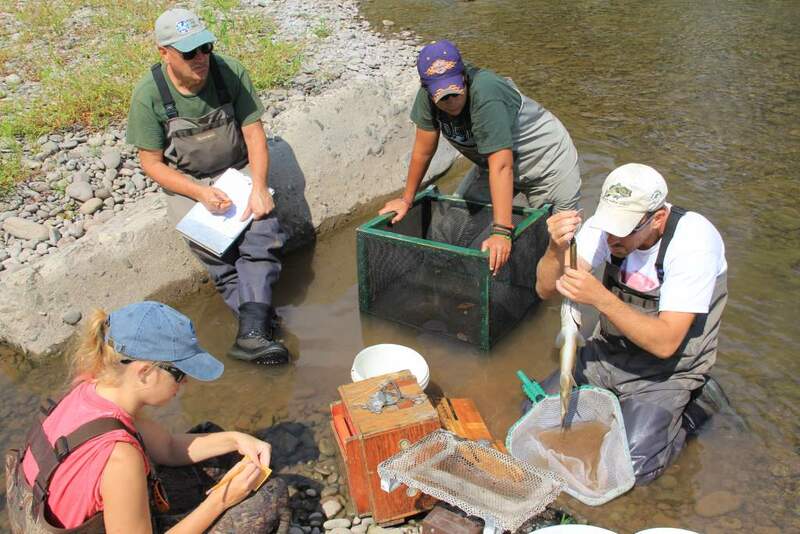 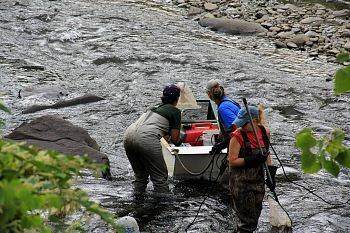 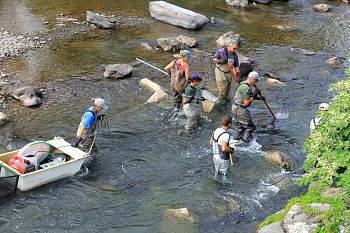 At the end they measure, weight and take scale samples of every fish. In this case it was almost 50 fish on the first pass ranging from 2" to 24". They record all this info, then... tada, they do it again.... twice! 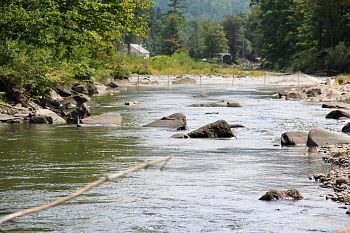 Makes me tired just thinking about it. The photos you see below were taken over a 2 hr period, and that was just ONE pass... BTW-All fish are released outside the netted area as to not be counted twice. The DEC folks said that their office does this 6 times a year. 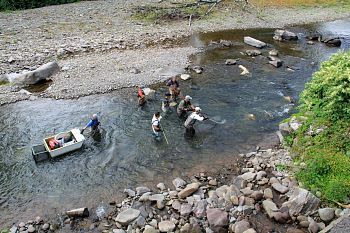 Obviously I found this all fascinating, but then I have fished this section of stream hundreds of times over the last 50+ years. There's a lot more fish in that stream that you'd ever think! 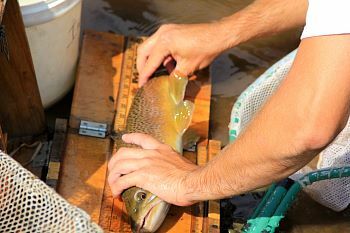 I would have guessed less than 5.